Abstract: mRNA-based therapeutics represent a game-changing category of biological drugs that holds great promise for the treatment of human diseases1,2. While the incorporation of naturally occurring modified nucleotides during the synthesis of mRNA has greatly increased their potency and safety3, challenges in selective expression have hindered some clinical applications. 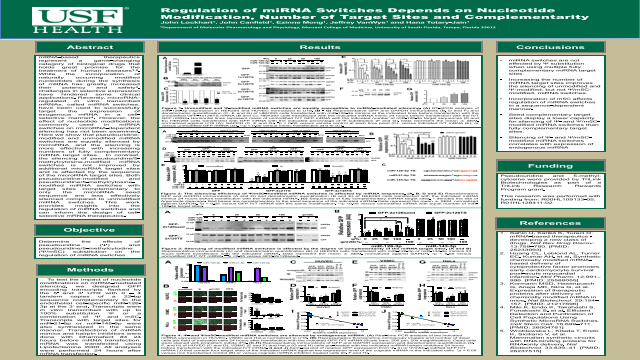 Recently, microRNA-regulated in vitro transcribed mRNAs, called miRNA switches, have been used to successfully target the expression of exogenous mRNA in a cell-selective manner4. However, the effect of nucleotide modifications commonly used in miRNA switches on microRNA-dependent silencing has not been examined. Here we show that pseudouridine-modified and unmodified miRNA switches are equally silenced by microRNA, and the silencing is more effective with increasing numbers of fully complementary miRNA target sites. In contrast, the silencing of pseudouridine/5-methylcytosine-modified miRNA switches is not improved by additional microRNA target sites and is affected by the sequence of the microRNA target sites. Both pseudouridine-modified and pseudouridine/5-methylcytosine-modified miRNA switches with target sites complementary to only the microRNA seed sequence are less effectively silenced compared to unmodified miRNA switches. This work provides insights into the regulation of miRNA switches and can inform the design of cell-selective mRNA therapeutics.